Tomorrow, Thursday, September 22, the cream of the engineering profession in Nigeria and people from all walks of life will converge on the Function Suite of the Sheraton Hotel, Ikeja, Lagos, for the second edition of the Annual Engr. 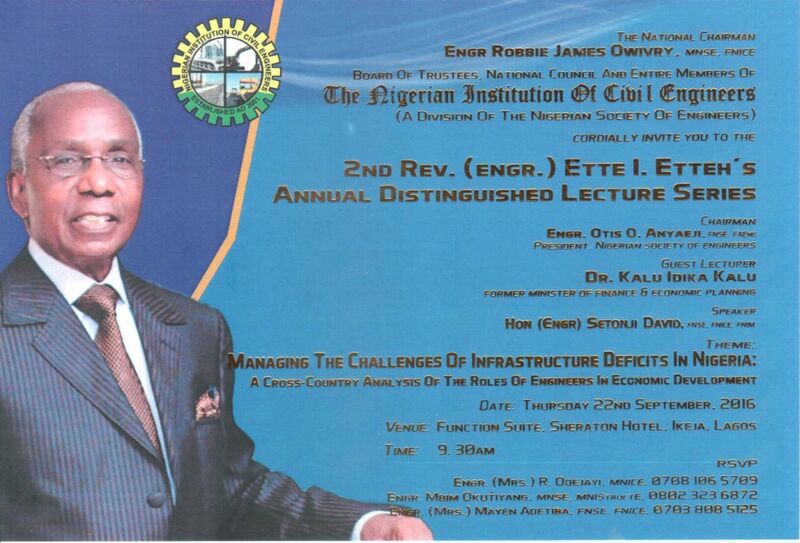 (Rev) Ette Ikpong Ikpong Etteh Distinguished Lecture Series. The theme of this year’s lecture is: “Managing the Challenges of Infrastructure Deficits in Nigeria: A Cross-Country Analysis of the roles of Engineers in Economic Development”. This is the second edition of the Annual Lecture series instituted by the Board of Trustees, National Council of the Nigerian Institution of Civil Engineers, NICE, a division of the Nigerian Society of Engineers, in 2015 in honour of one of Nigeria’s outstanding Engineers, Engr. (Rev) Ette Ikpong Ikpong Etteh, OFR, co-founding Principal, Etteh Aro and Partners, based in Ibadan, Oyo State. Tracing the trajectory of Etteh’s life history clearly shows that he has had a robust professional practice spanning decades of exemplary dedication to the tenets of the profession as well as training and mentoring of many engineers, who today, can stand to be counted. It is because of the impact his professional practice has had on the profession that his professional colleagues deemed it fit to honour him for his achievements by instituting the Annual Award and Lecture Series in his name. A comprehensive chronicle of the life trajectory of Etteh, rolls out like a command performance premised on a divine script being acted out by a consummate thespian before a thrilled audience. The script showcases the kind deeds, unequalled philanthropy and positive humanity exhibited by one man – Engr. (Rev) Etteh – who has built solid bridges and forged concrete and mutually beneficial alliances where others who dared failed. From his richly-endowed profile, Etteh emerges as a profoundly celebrated professional who has, through foresight and networking, interfaced with like minds to build goodwill, linkages and connections and deployed same for the benefit of the people, including those who have never met him. Etteh offered himself to provide a fresh platform for the pursuance, realization and consumption of those pristine indices of leadership at both personal and corporate levels, as a personal lodestar. Coming from a close-knit family background that thrived on mutually-held positions that will benefit the commonwealth, one would have expected Reverend Etteh to be imperious and uncaring for other people’s interests and feelings except his nuclear family. No. This early behavioural template, which, in the main, de-emphasised personal interests, formed the concrete foundation and standard for his trademark detribalised disposition, selflessness, humanity, unparalleled philanthropy and positive worldview on diverse issues, which are clear testimonies to the early family training Etteh had. His life, definitely, followed the dynamics of a well-plotted graph. Tracing the trajectory of Etteh’s life journey, one will find a cache of altruistic ingredients, especially in his attitudinal disposition to the welfare of others and his adherence to professional excellence and ethics. Engr. (Rev) Etteh, OFR, co-principal partner of Etteh Aro & Partners with head office in Ibadan, Oyo State and branches in many cities in Nigeria since 1970, was born on December 16, 1935 at Akassa, in present day Bayelsa State. His father, late High Chief Ikpong Ikpong Etteh and Deaconess Nkaepe Uketo Ikpong Etteh, were originally from two royal families in Ukpenekang in present day Ibeno Local Government Area of Akwa Ibom State. He had his elementary education at St. Patrick’s School, Ifiayong, from 1945 to 1947 and Holy Trinity School, Mbiakong in 1948, all in Uruan Local Government Area of Akwa Ibom State. For his secondary education, he attended Hope Waddell Training Institute, Calabar, Cross River State, from 1952 to 1958. Before he was employed as an Assistant Statistical Officer in the Federal Department of Statistics from 1959 to 1961, Reverend Etteh had a short stint as a Mathematics Teacher with the Lutheran High School, Obot Idim, from January to November 1959. Thereafter, he got admission into Ahmadu Bello University, Zaria, in 1961 to study Civil Engineering on scholarship. A momentous happening occurred in the 1963/1964 academic session in ABU, Zaria. Two sophomore students, Lawrence Oluwemimo Arokodare, a Yoruba from Ijero Ekiti, in Ekiti State who was studying Mechanical Engineering had changed course to Civil Engineering and his friend, Etteh, from Upenekang in Akwa Ibom State, decided to come together and forge a common business front and compete to ultimately shove aside the dominance of the then foreign-owned Ove Arup and Partners. The duo was ready to put into practice a cardinal principle propounded by Professor Naylor, a Professor of Civil Engineering, that emphasised that the five years of professional practice should be paramount, if they hope to succeed in their civil engineering endeavours. However, the take-off of the new company did not commence until 1970 with an inaugural project of the rehabilitation work on the 80-mile Benin/Asaba Road, Prior to this, the two young friends had worked at Ove Arup in Ibadan and garnered cognate experience with a company they were plotting to compete with and even surpass in the coming years. It is interesting to note that the two promoters of the incubated Etteh Aro & Partners, went to the United Kingdom for further studies, on loan. Reverend Etteh and Arokodare had graduated from ABU Zaria with Bsc. in Civil Engineering and the UK trip was to enhance their professional armoury and prime them well to face the challenges of floating and operating Etteh Aro & Partners. In addition, Reverend Etteh obtained an MSc (Highways) Surrey degree, in 1969; a second MSc (Bridges) Surrey degree, in 1973; MICE, C.Eng. (1969); MNSE (1971); FNSE (1981) and Foundation Fellow of the Nigerian Academy of Engineering (1995). In recognition of his outstanding performance in theological studies at the Immanuel College of Theology, he was awarded the institution’s Diploma in Theology in 1997. In addition, he was ordained a minister of Word and Sacrament of the Presbyterian Church of Nigeria on June 7, 1998. On the state and national stages, Engr. (Rev) Etteh has been saddled with the responsibility of being chairman of the board of Calabar Cement Company (1975 to 1980) chairman, Federal Mortgage Finance Company (1993 to 1994). At various times, he was a member of the different committees of Road Vision 2000, which gave birth to the Independent Road Fund and the Board for Road Maintenance in 1998; Architect (Dr.) Godwin Odumah’s Committee on the Appraisal of the National Housing Programme in 1995; the Engineer S. O. Fadahunsi Panel on the Review of Federal Government Contracts that resulted in heavy savings on costs in 1978; the Ibom International Airport Implementation Committee. He has also served as chairman of the Technical Sub-Committee for the same Airport in addition being a current member of the Committee on Road Transportation Framework. Professionally, Reverend Etteh has been honoured with several awards which include the Presidential Merit Award (2005), in recognition of his unique support for the cause of engineers in Nigeria. Etteh is one of the first five engineers to be inducted into the Nigerian Engineers Hall of Fame in 2013. Among his other honours are: Nigerian Institute of Civil Engineers Merit Award in 2002; Excellence Award in Engineering by the Nigerian Society of Engineering, Uyo in 1993. Furthermore, he is a former Chairman of the Association of Bridge and Structural Engineers, Nigeria Chapter (1989 to 1998). In 2001, he was conferred with the national honour of Officer of the Federal Republic, OFR, by then Nigerian President, Chief Olusegun Obasanjo.